AVIATION IN AUSTRALIA AND PIONEERS. I WAS very interested to see in FLIGHT of March 16th an article on "Aviation in Australia and Pioneers," and as the subject is evidently of interest I am sending you a brief account with photos of my own early efforts. 1st attempt, 1909. A pair of wings only. Result, not a success. 2nd effort, early 1910. 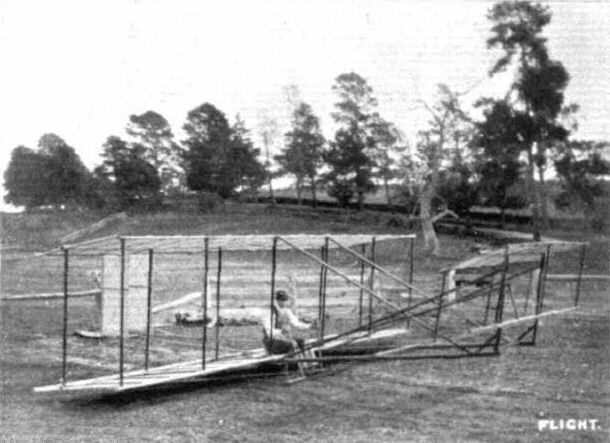 1/2-size Wright glider (Photo enclosed). Flown in strong winds, anchored to 120 yards of fencing wire. Left ground successfully and rose 4 or 5 ft.